You just can’t keep a baker from baking . 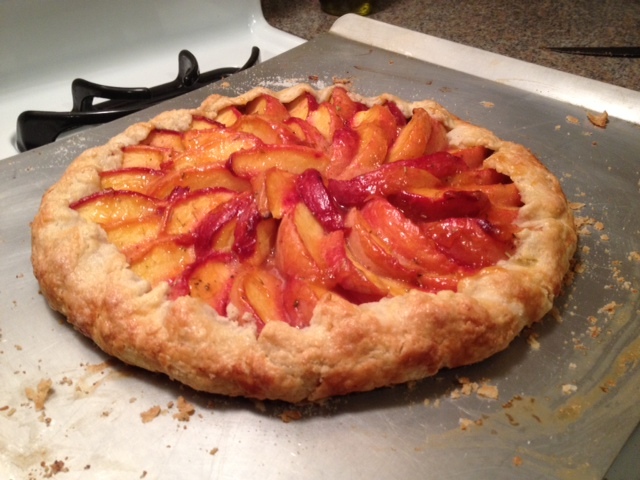 . . James bought some delectably ripe peaches at the Farmer’s Market in Red Bank and began dreaming of peach tart. However, the kitchen at the theatre housing is not equipped for a serious baker (thought they did buy a set of measuring cups and spoons just for James!) so he decided to do a rustic-style tart that would not need a tart pan. First, he cut up the butter into 1/4″ cubes and froze it overnight. No pastry cutter? No problem! 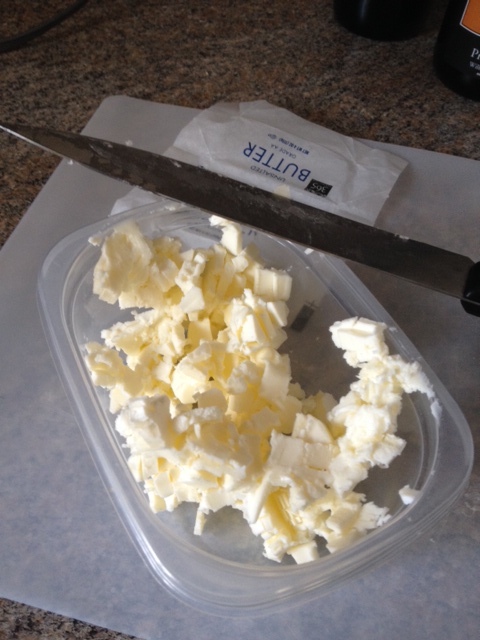 James just used his trusty Bowie knife — uh, butcher knife — to cut the butter into the flour mixture on the cutting board. Then it came time to roll out the pastry. 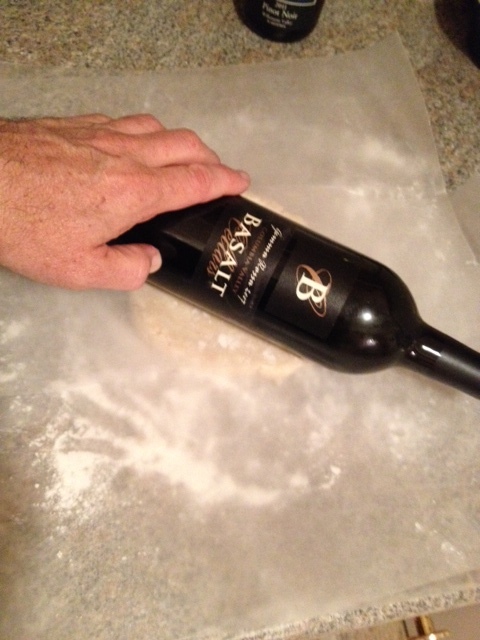 No rolling pin, of course, but a wine bottle worked nicely. 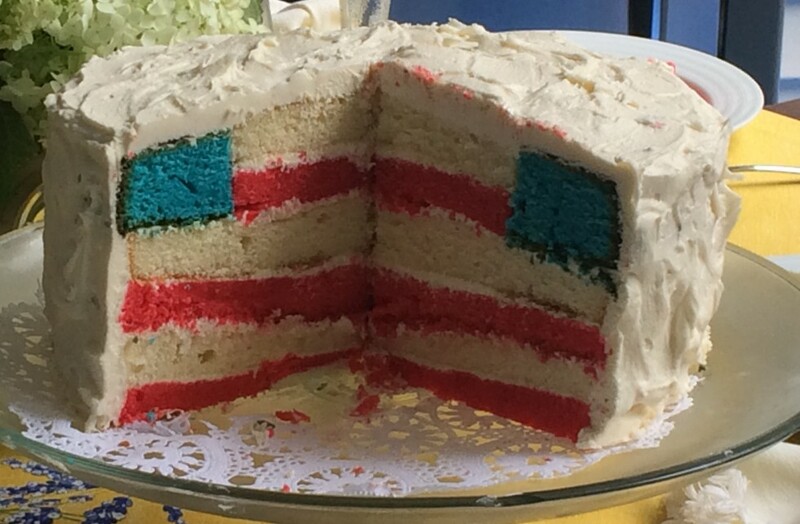 James reports that the crust was one of the flakiest, most delicious he’s ever made and the dessert was a hit. 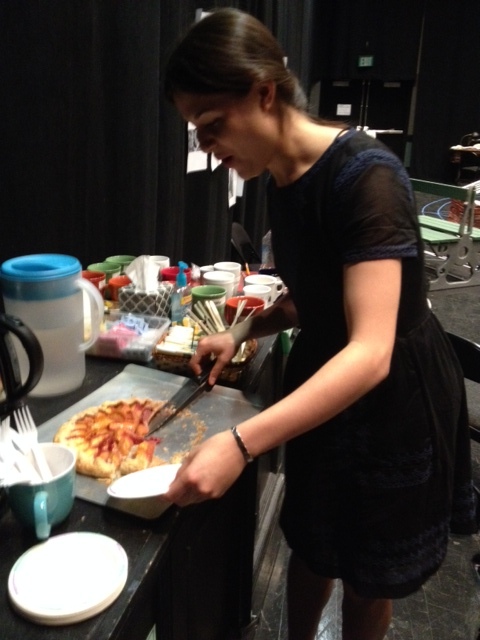 Here is actress Phillipa Soo trying the Rustic French Peach Tart. She is playing Agnes in the production of THE SCHOOL FOR WIVES. 1. Place the flour, salt, and sugar into a food processor and pulse until well combined. Add half of the butter cubes and pulse 6 to 8 times. Then add the other half of the butter cubes and pulse 6 to 8 more times. You should have a mixture that resembles a coarse meal, with many butter pieces the size of peas. 2. Add a couple tablespoons of ice cold water (leave the ice in the glass!) to the food processor bowl and pulse a couple of times. Then add more ice water, slowly, about a tablespoon at a time, pulsing after each addition, until the mixture just barely begins to clump together. If you pinch some of the crumbly dough and it holds together, it’s ready, if not, add a little more water and pulse again. Try to keep the water to a minimum. Too much water will make your crust tough. 4. When you are ready to roll out the dough, remove the disk from the refrigerator and place on a clean, smooth, lightly floured surface. Let it sit for 5 to 10 minutes to take just enough of a chill off of it so that it becomes easier to roll out. Sprinkle some flour on top of the disk. Using a rolling pin, roll out the dough to a 12-14 inch circle, to a thickness of about 1/8 of an inch thick. As you roll out the dough, check if the dough is sticking to the surface below. Add a few sprinkles of flour if necessary to keep the dough from sticking. Place on a cookie sheet or jelly roll pan. 2. 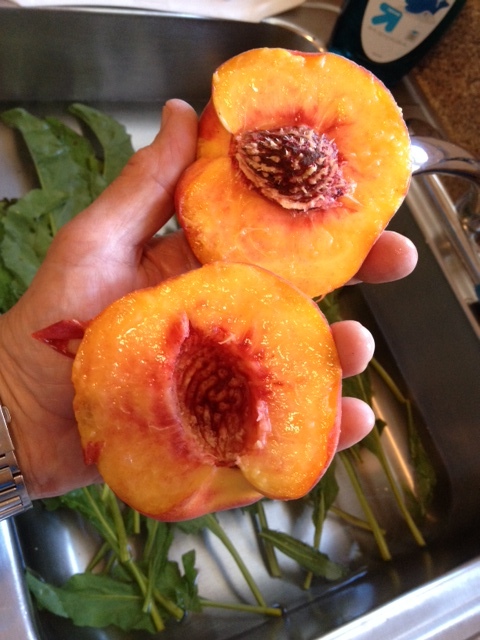 Slice peaches in half, then cut each half into π inch slices. Place peaches in a medium bowl and drizzle with lemon juice. 3. Add sugar, flour and Herbs de Provence to the peaches. Toss to combine. James leaves the skin on the peaches for the final look of the tart. 4. Sprinkle almond meal over the rolled out dough. This will absorb the juice of the peaches and also give it a wonderful flavor. 5. Place peaches in a single layer over dough, leaving a 1 1/2 inch border around the edge. 6. Fold the edge of the dough to cover the outermost peaches. 7. Combine egg and water and whisk with a fork. Brush crust with egg mixture and sprinkle with sugar. Bake tart in the lowest part of the oven for 50 minutes or until crust is crisp and browned. Let tart cool slightly. 8. Brush peaches with peach jam. Dust edges with powdered sugar.